Professor Yotaro Takano is in my opinion an extremely intelligent, intuitive, independent researcher at the University of Tokyo. He has the acumen to stand up to the prevailing notion that Westerners are independent, whereas Japanese are collectivists (Takano & Osaka, 1999; Takano & Sogon, 2008; 高野, 2008), presenting compelling data to show that there is little difference in the extent to which Americans and Japanese conform with groups. I think that he goes too far, however, when he denies cultural differences entirely, as this post will argue. His other, and more profound area of expertise is in research explaining the sense of mirror reverse perceived in respect of people and symbols as reflected in mirrors (Takano & Tanaka, 2007; 高野, 1997). Professor Takano posits a dual (or multi) explanation claiming that the reason that we see symbols reversed is different to the reason why people, especially ourselves appear reversed. In support of this assertion he has published data which shows that while almost all subjects felt symbols to be reversed, nearly half of the 102 Japanese subjects at Tokyo universities (above right) did not feel their own reflection to be reversed, contrary to the assumptions of previous research. He argues that this suggests something different is going on in our impression of mirror reversal and symbol reversal. I hold, after scholars such as Watsuji (2011) that the Japanese are far more likely to identify with their face, and mirror image than their self-narrative, as is common among "homo-narans" (人言）in the logocentric West, since the Japanese have (simulated) a mirror in their head or mind (Heine, Takemoto, Moskalenko, Lasaleta, & Henrich, 2008). 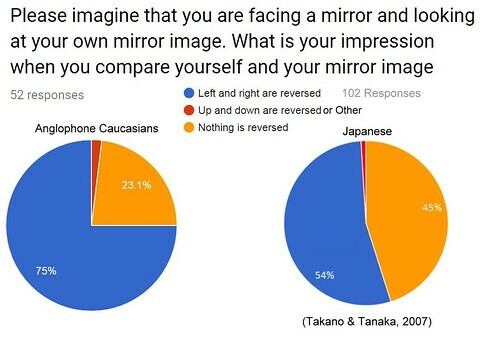 When looking at a mirror, therefore, it seemed likely to me that Westerners, more than Japanese, would be likely to feel their mirror image to be reversed since to a Westerner, in so far as a mirror image is a person and has a frame of reference, it is another person, whereas Japanese are more likely to feel that that images are people, and that person in the mirror is themselves. I repeated Takano and Tanaka's experiment (2007) upon Caucasian anglophone (recruited online via Prolific) and found that the percentage of those Anglophones lacking the impression of reversal was approximately half that of Japanese, at 25%. I also think that there may be a similar difference when subjects are asked whether their self-talk comes before or after or at the same time as their decisions. Research (Nisbett & Wilson, 1977; Libet, 1999, Soon, Brass, Heinze, & Haynes, 2008, Haidt, 2001, 2004, 2013) argues that our self-talk comes after our subconscious decision making acts. This research showing a reversal in time, I feel, comes as quite a blow to Westerners who identify with their "cogito" or self-narrative. The reversal in time may therefore, by a Nacalian transformation (Takemoto & Brinthaupt, 2017), correspond to the aforementioned reversal in space, denied to a greater extent in the culture to the degree of identification in each modality of self representation: language and image. Whether or not the is a similar (but reversed) difference in impressions of self-narrartive reversal, I think that it is the ability of Japanese see themselves, or have a 'mirror in their heads', that enables Japanese to be so as non-conforming as Westerners (who listen to themselves). Among Western populations, mirrors generally reduce the tendency to conform since they increase *private* not public objective self awareness (C. S. Carver, 1975; Charles S. Carver & Scheier, 2001; Davies, 1982; Goukens, Dewitte, & Warlop, 2007).